COSTA MESA, Calif. (Apr. 10, 2019) – The OC Running Festival, a world-class, three-day event will introduce its more than 23,000 participants from 46 states and 22 countries to the new 26.2 Brew as Marathon Brewing Company becomes the Official Beer Sponsor for the 2019 and 2020 events. Now celebrating its 15th year, the OC Running Festival will be held May 3 to 5, 2019, and features the OC Half-Marathon, OC 5k, OC Music Festival, the Kids Run the OC “Final Mile”, and the OC Lifestyle and Fitness Expo. Just introduced by Marathon Brewing Company, an endeavor of The Boston Beer Company, 26.2 Brew is the beer made by runners for runners. Hailed as a golden, hazy ale with a crisp body and clean finish, the new beer a refreshing reward for all levels of runners, from enthusiasts to marathoners. 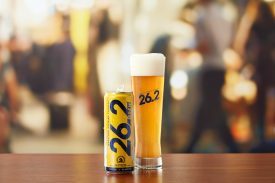 26.2 Brew has 4.0% ABV, 9g carbs, and just 120 calories. On Saturday, May 4, more than 3,000 people will compete in the OC 5k, followed by the OC Music Festival featuring great food, lively music and fun for the entire family. Also on May 4, approximately 9,500 local children, who completed a 10 to 12-week, in-school fitness program accumulating 25.2 miles of activity, will finish their “final mile.” The Kids Run the OC program was created in 2006 by the non-profit OC Marathon Foundation to promote health and fitness among school-age children. It is one of the largest youth running programs in the country with more than 65,000 Orange County students participating since inception. Marathon Brewing Company is not sponsoring the Kids Run. Now celebrating its 15th year, the 2019 OC Marathon Running Festival is a world-class event featuring the SDCCU OC Marathon and Half-Marathon, the OC 5k, the Kids Run the OC Final Mile, the Ultimate Finish Line Festival, and the OC Lifestyle and Fitness Expo, all held at the Orange County Fair and Events Center in Costa Mesa, California, from May 3 to 5, 2019. The marathon and half-marathon is one of the best destination courses on the West Coast with a diverse terrain, changing coastal and inland vistas, and majestic ocean views. During the weekend, more than 23,000 participants, including nearly 10,000 children, will enjoy food, music and other family-fun entertainment.